A Cardboard Problem: What is off on this Triple Threads card? There have been some very pretty cards (like this one) to be pulled out 2011 Triple Threads this year. There have also been some duds. Then, there is this card (which I found on this auction courtesy of @JuddFamilyStone on Twitter). First glance, I was floored. The design is great. The bat knob is fantastic (the bat is about 70 years old). And the jersey ... Wait. Here's a closer look at the jersey from a picture in the auction. According to the back of the card, "The relics from this card are not from any particular game, event or season." Here's a card that didn't need this jersey on it. The bat knob is such a good piece that it could have stood on its own without anything added to it. So, what is this jersey then? Any guesses? I'm stumped. The Yanks were not that white until well, well after Lou's playing days. I was going to say Old Timer's Day, but unfortunately Gehrig would not have been around when these started. I can't see any use for the patch. I hate those things, anyway. I can see owning a whole jersey, but just barely. But putting a patch on a card that already has a piece of a bat? Why waste the patch? They're probably hoping that this kind of card would take off in value, having two memrobilia pieces on it. THAT is bizarre. Really bizarre. I am half-tempted to drop this link on Topps' twitter sitter just to see how quickly they can respond with a corporate platitude. Agree with your sentiment, Sooz - the bat piece could have stood alone. Of course, if the jersey swatch was that beautifully faded wool with a couple of delicately thin pinstripes from that era.....then it might indeed be "the set's holy grail" (according to the wiki-wise seller). Since it is just us Yankees fans so far - anybody else think the hostage picture on the backside of the Babe's 1/1 detracts? Maybe the Gehrig jersey came from the Halper collection. Maybe it's a piece of his BVD's. I wonder whose little leaguer's bat had its knob cut off for the bat knob relic. 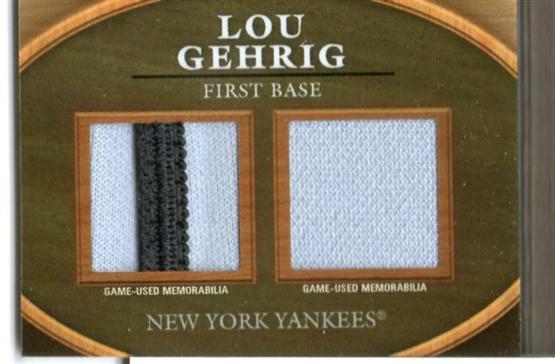 If the card doesn't state the jersey is Gehrig's, the knob probably isn't also. Is there another Yankee batknob (one word or two?) from Triple Threads? And does that knob have flannel swatches? If so, Topps may have done the ol' switcheroo. If Topps can't be bothered to document the pieces of memorabilia used in making high-end, presumably one-of-a-kind cards, they should just stop. This reminds me of the Honus Wagner Sterling relic form last year with the far too modern jersey piece. I was thinking of that Sterling Wagner too. But maybe this is a jersey from a movie from the actor who played Gehrig. I mean, it's practically the same. Maybe it's a jersey worn by an Abbott and Costello impersonator at a midwest county fair doing the Who's On First routine. If you don't read Beckett's feed, this card has made its way onto their blog as well. I'm with Paul. This product should not have "event" used anything. I look forward to Topps explination of this one. That is a polyster jersey swatch from a modern jersey. The polyster jerseys did not even make it to the field until the early 1970s. 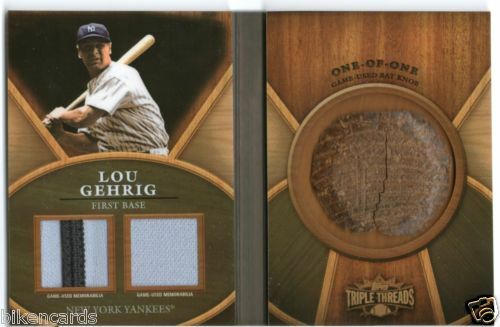 As a Gehrig collector this saddens me, I am fortunate enough to have a couple of Gehrig relics in my collection and they are all wool flannel. Another fumble by the Topps team. There is the possibility the card was altered, but why you'd alter a 1/1 is beyond me. This is more proof that Topps (and other companies) should document jersey/relic cards - scan/photograph all the big hits before they go into packs. Cards with material from pre-WW2, patch cards, etc should all be cataloged to help record the card manufacturing process. Then when a card hits like this and questions start to be asked, Topps can verify the image to see if it's been altered after manufacture. I'm not saying it's not Topps' fault, but it offers them a little more protection. Data storage isn't that difficult, and for cards that will be selling for big bucks, the small investment in scanning/photographing time offers yet another level of assurance. Plus, I still don't see a reason why images of cards like this aren't released via websites (overlay a big Topps watermark to protect against eBay listing) to pump more interest into the product. I believe Panini does a pretty good job of that. So...what particular reason are these swatches even associated with Gehrig? Are we supposed to just take their word for it that somehow these are relevant to him? Are these swatches even era-believable? Are they flannel? Are they anachronistically synthetic? Are they made out of old-school gum tree rubber? I completely agree with you. These impostor relics just clutter up a card with fabric on the front and weasel word nonsense language on the back.